Description: Even though it was way too dark, I couldn't resist trying to fudge this one. Even the Dark Future paint scheme looks good when it is this shiny and new. Description: The engineer has just cut of head lights as these two new units pull to stop for a juick break at Monroe's yard office. Description: Eastbound freight through Twin Ledges at Middlefield. 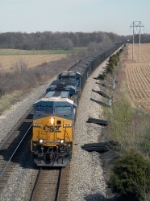 Description: A westbound intermodal train passes a stationary mixed freight train, near West Yough Junction. Description: Emerging from the tree tunnel between SR 46A & Airport Blvd. Description: CSX ES44AC 813 trails on Q502 North. Description: A northbound CSX pig train passes old buildings and is about to cross the NS mainline enroute to Manchester GA. Description: Q139 makes track speed under the C&O signal at Fort Spring enroute to Russell, KY. Description: This Loaded Coal train came off the CN Edgewood Cutoff from Sugar Creek Mine. Description: Q029 rolls past Stones River National Cemetery. Description: CSXT 813 sits at UP's Englewood Yd. Track R9. Description: Westbound loaded trash train Q703 with 813 leading on the single main track of the Philadelphia Subdivision near Rossville, MD. Description: Q410-17 rushes through Woodbourne with CSX ES44AH 813 leading CW40-8 7375 and C40-8 7616. Description: Second Q410 on this day. Description: Q702-23 moves through Woodbourne with the first and third units from Q410-17 on Tuesday, with CSX ES44AH 813 and CSX C40-8 7616. Description: Q368 passes the Dolton signals with 21 cars and one motor in tow. Description: A loaded coal train heads east along the Youghiogheny River in downtown Connellsville on a humid summer afternoon.